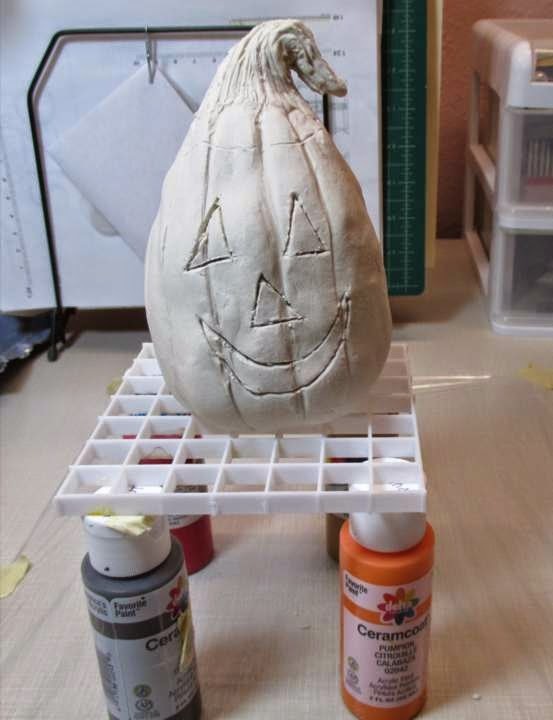 I’ve been making tiny jack-o-lanterns with paperclay for quite some time, but this year, I thought it would be fun to try a larger version and use them as tea light covers. They turned out so cute, I’ve now made five of them! They look good in a little grouping, or I might spread them out on a windowsill or mantle. The tallest one in this group is about five inches high. 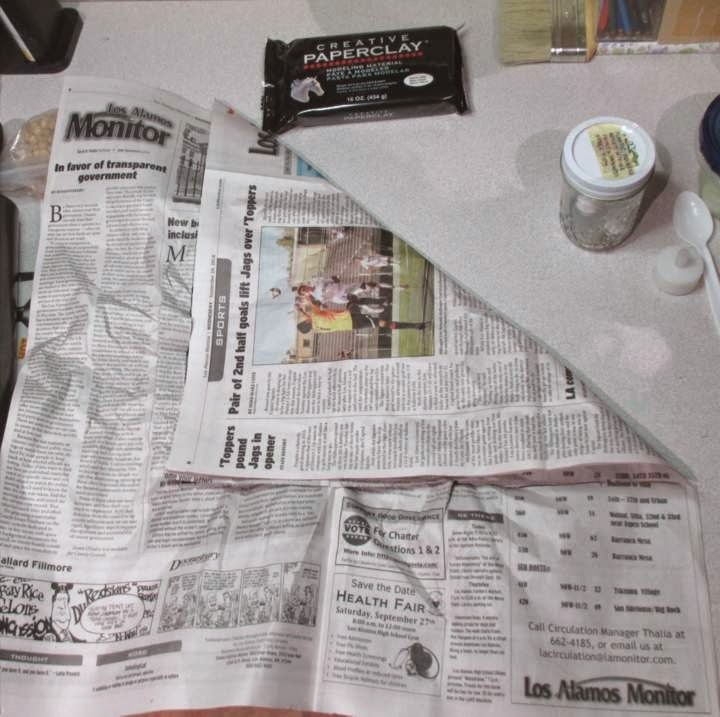 Place cup or jar in center of square and bring edges of paper up and around the jar, as shown below. 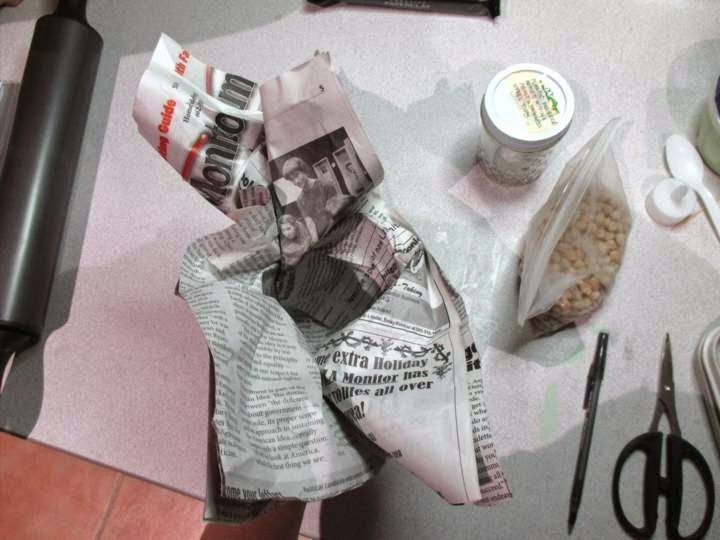 Still holding onto newspaper, open the top portion out, remove jar, and loosely fill cavity in newspaper with beans. 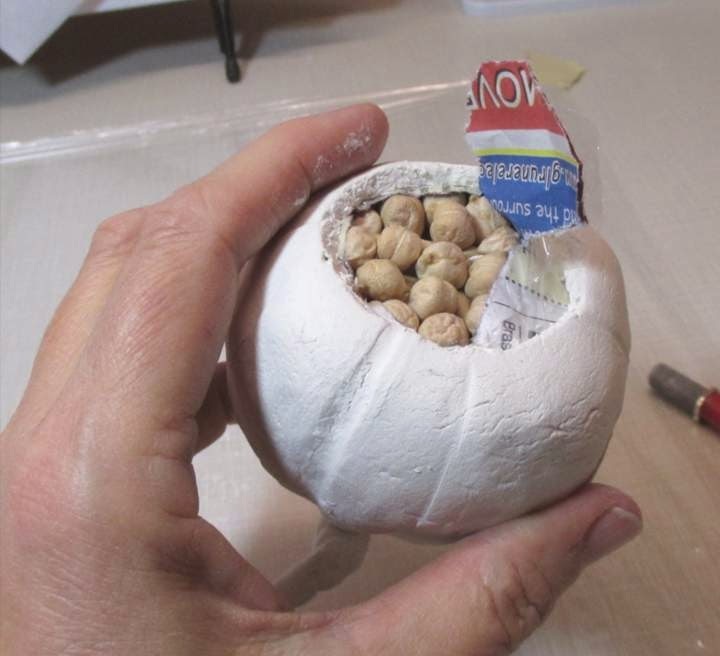 Twist top together, cut off excess then seal with masking tape. 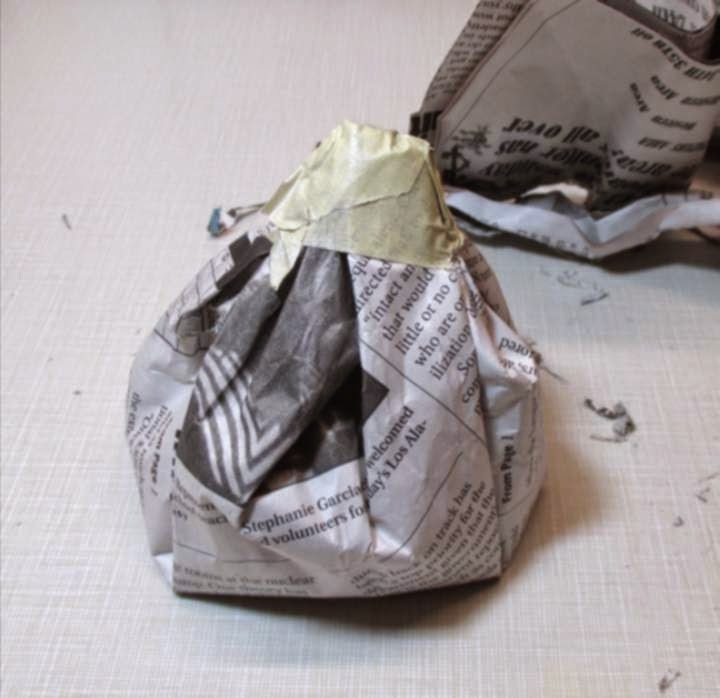 Shape the newspaper bag of beans into the pumpkin shape you like and tape into place. 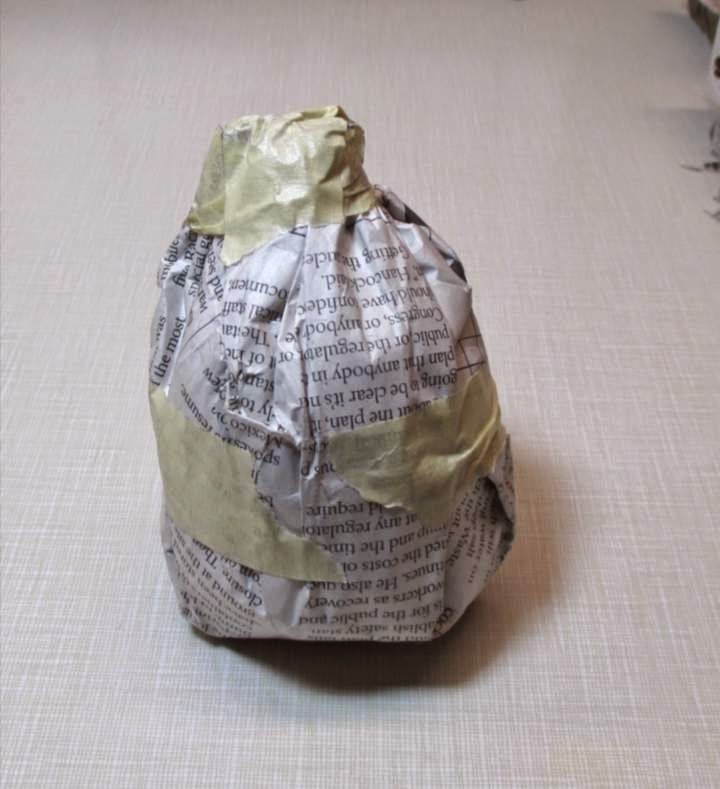 Place the newspaper form in the center of a square of plastic wrap, pull up edges of wrap, twist top together and tape down securely. 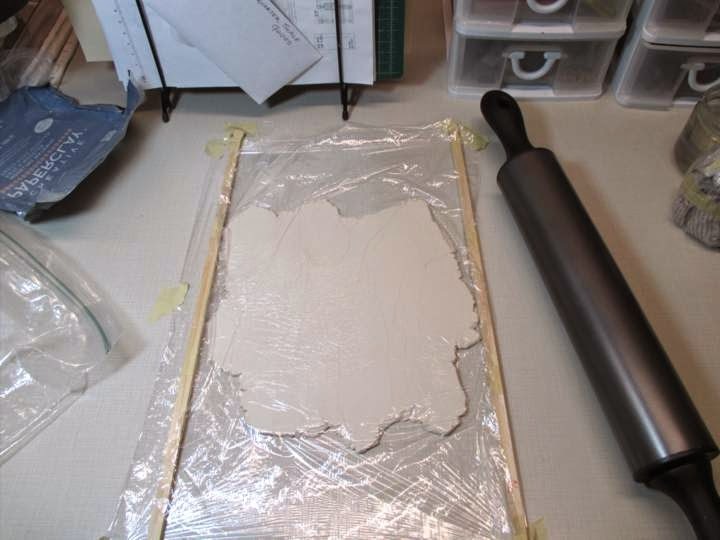 Now that the form is ready, roll out an even layer of paperclay to a 3/16″ thickness. 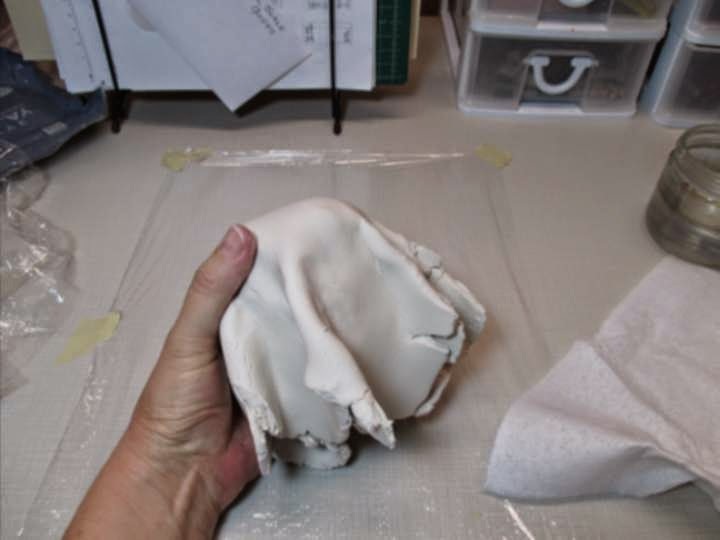 You can use 1/8″ if you want to use less clay, but the risk is greater that you will get some areas too thin while sculpting the clay over the form. 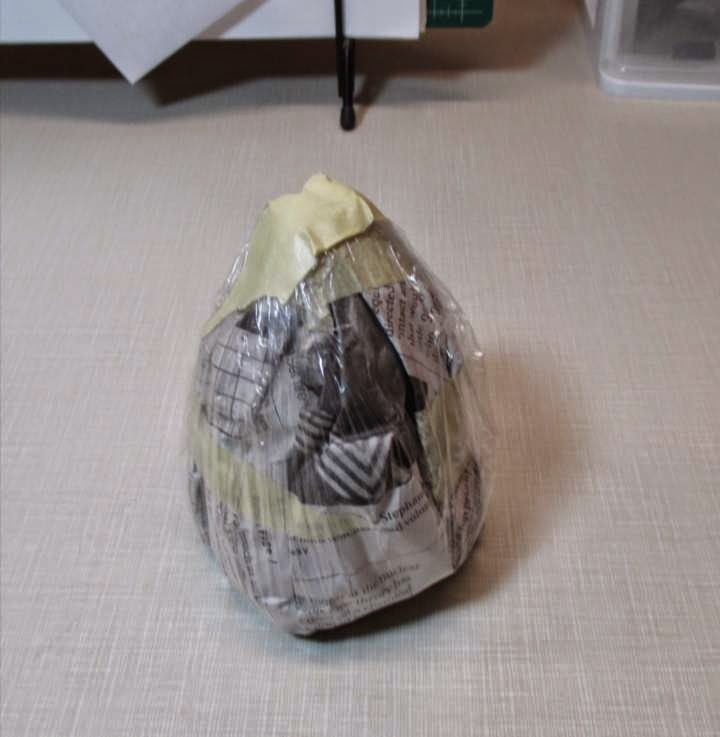 Put a lump of paperlcay on the plastic wrap, lay another sheet of plastic wrap over that, and start rolling. 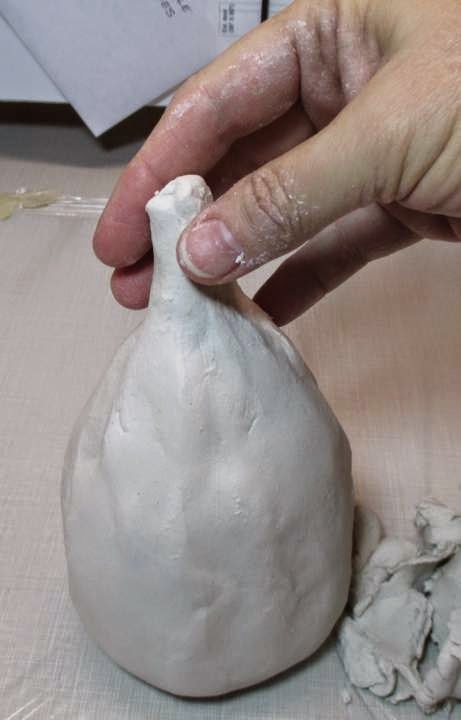 Lift and turn the paperclay occassionaly to avoid it sticking to the wrap. 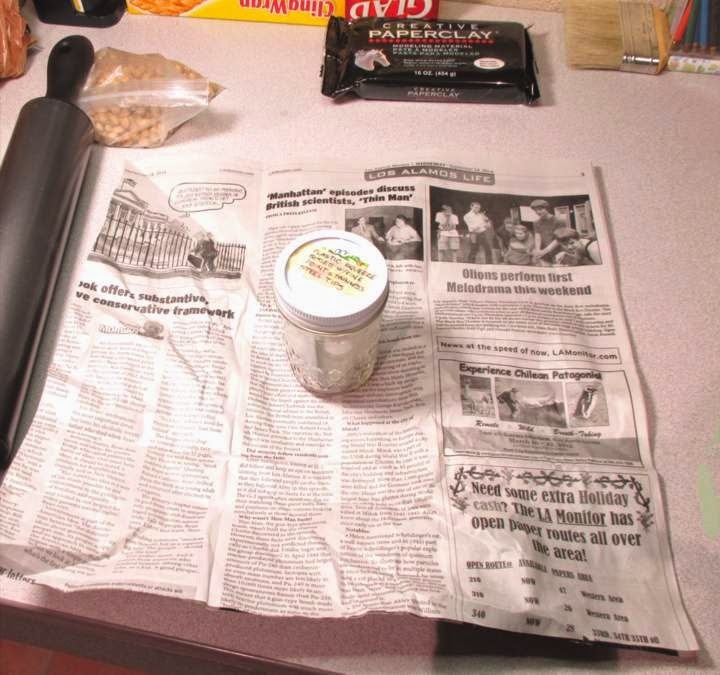 Continue rolling out the clay until your rolling pin is flush with the wood strips (the paperclay isn’t getting any thinner, the rolling pin is riding along the wood strips). You can also use dough bands if you have them, but it’s best to still keep the clay within two sheets of plastic to avoid it sticking to the rolling pin. 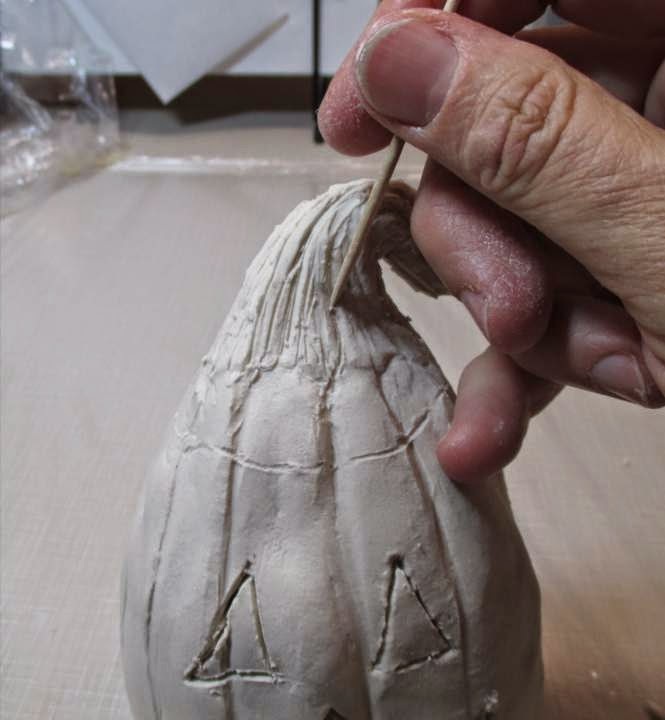 Wet your fingers and begin smoothing the clay over the pumpkin form, pressing and pinching the excess into folds. 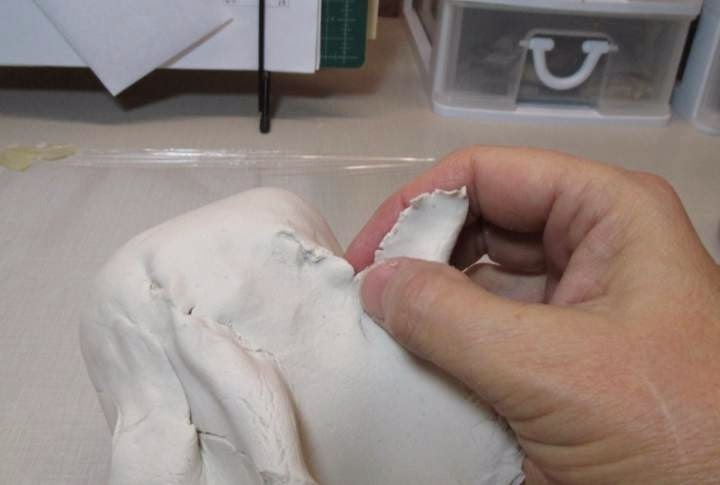 Pinch off excess from folds, wet and smooth the seam. When you get to the bottom, turn the form over and shape the excess into a stem. Don’t worry about detailing the stem at this point, just make the basic shape. 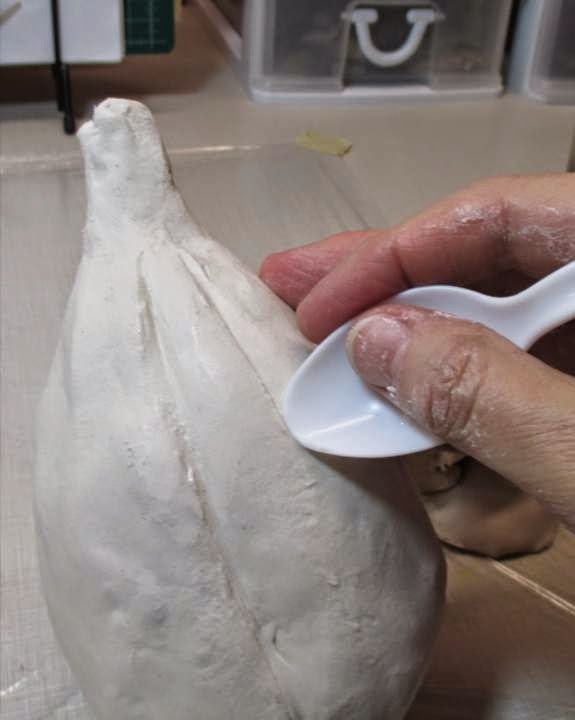 Now dip the spoon in water and use the back of it to sculpt sections into the pumpkin – First sculpt a line down the pumpkin with the spoon held to the side, then go back down the same line with the spoon pressed to the opposite side. The curve on the back of the spoon makes the perfect slant to the sections and does the work for you of rounding them out! 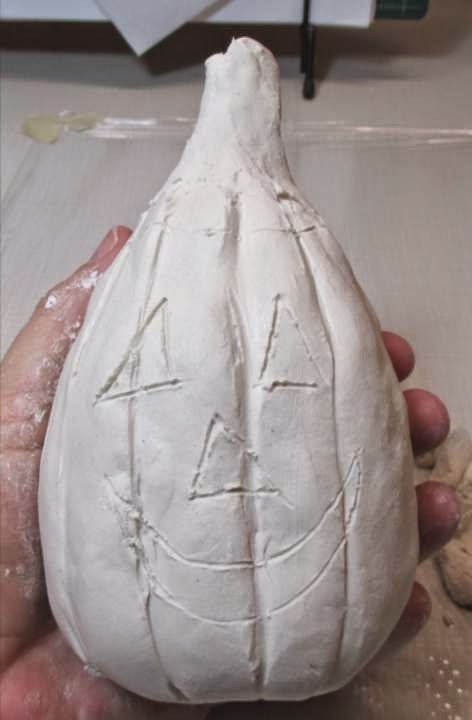 When you have the sections sculpted all the way around, lightly draw your jack-o-lantern face in with a toothpick, and draw a light line around the top, if desired, to make the jack-o-lantern look as if someone had cut the top off to scoop out the seeds. If you mess up your drawing, just wet your finger and smooth the line back down. When you have the face the way you want it, use your craft knife in a gentle up and down motion over the drawn in lines, pressing just hard enough to reach the plastic wrap (though it won’t really hurt anything if you go a bit beyond it here and there, so don’t worry about it too much) Don’t drag the knife along – we don’t want the sections cut out, we are doing this so we’ll be able to cut them out easily when the clay is dry. Don’t remove the sections. 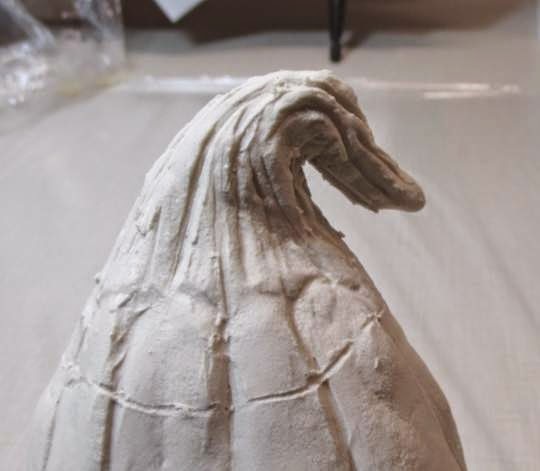 The sections are left in place to help prevent the clay from shrinking and having the edges curl while drying. 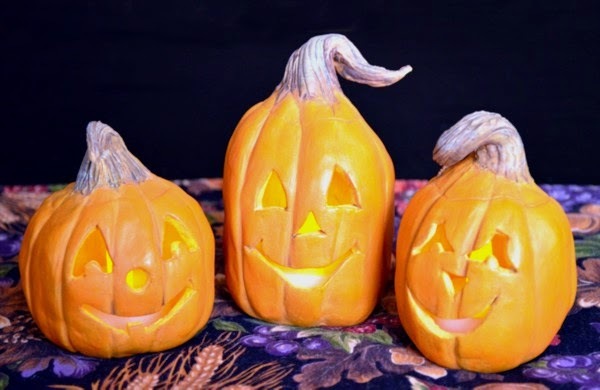 Lightly press the bottom of your tea-light into the bottom of the pumpkin to mark the dimensions, then do the same pre-cutting process with the craft knife about 1/16″ inch to the outside of those dimensions. 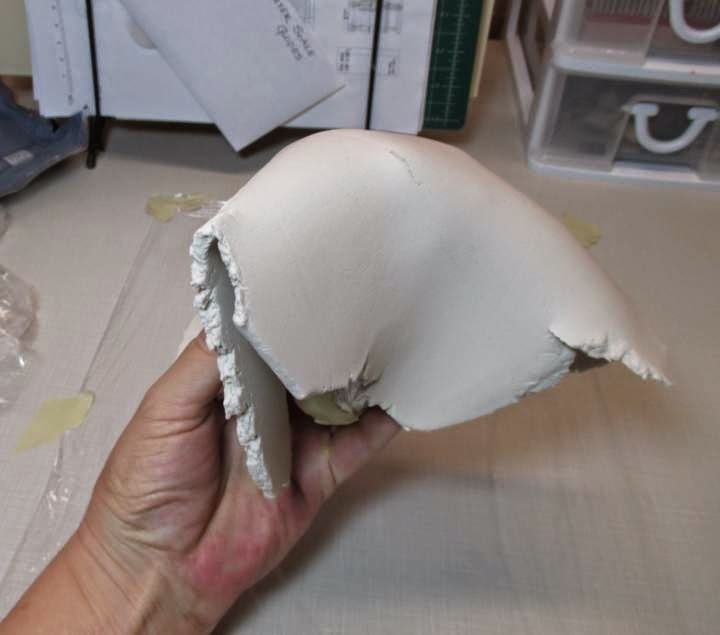 Again, leave the clay in place and don’t remove this piece. Now it’s time to detail and position the stem. 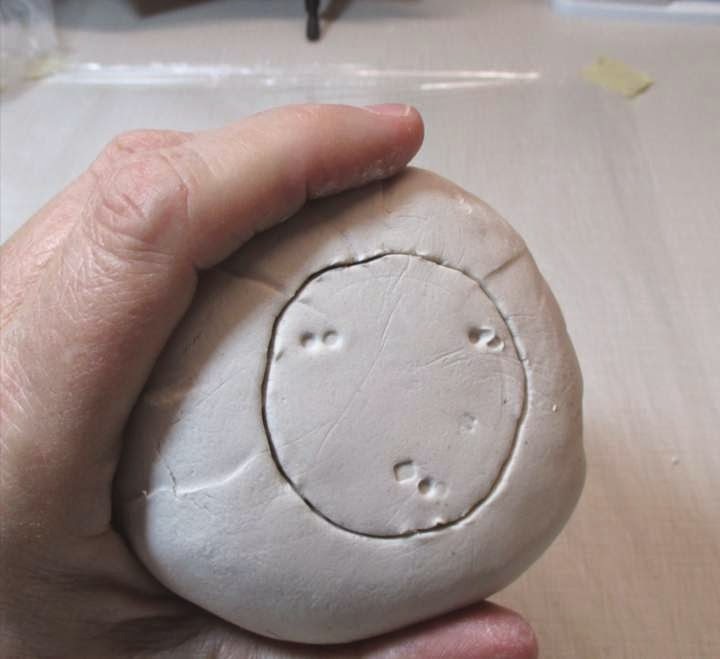 We saved this for last because the curves would have been lost while handling the clay for the rest of the sculpt. 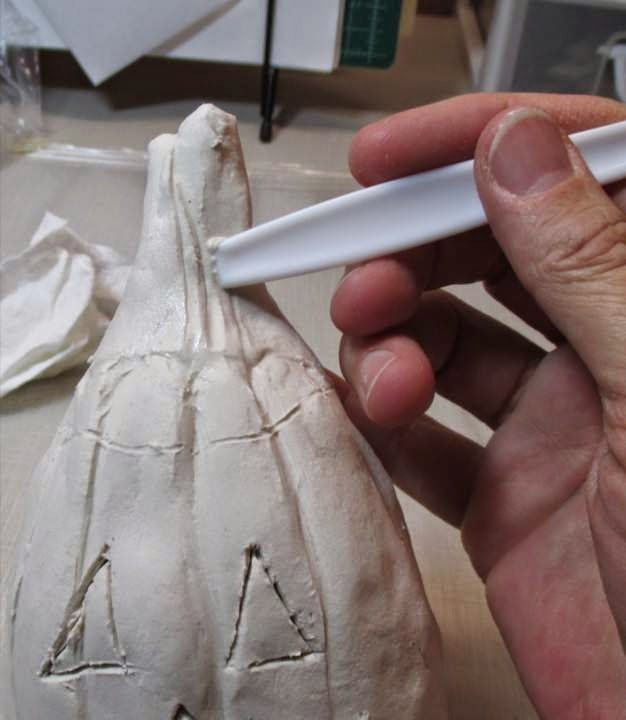 You will probably need to wet the whole stem portion down again before sculpting, so dip you fingers in water and wet the stem, and, if necessary, work some of the water into it and reshape. 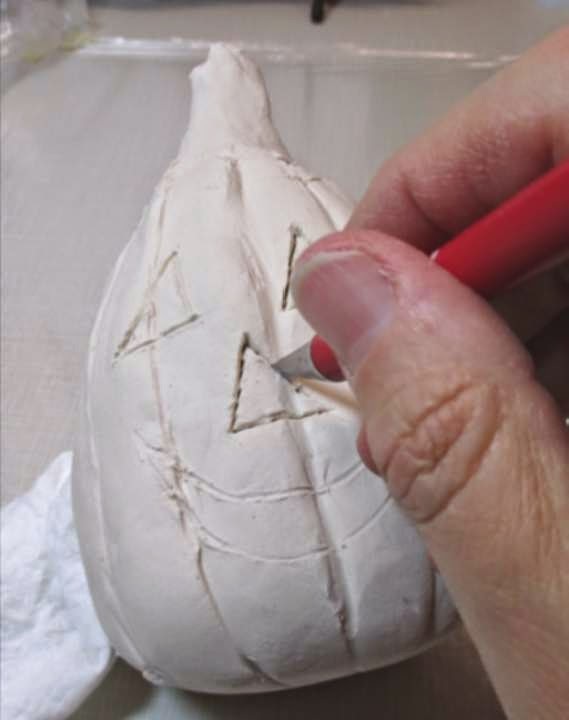 Sculpt details into the stem with the back of the spoon, twist stem into desired shape (or leave it standing straight up if you like, that’s pretty cute too!). Use the toothpick to add further details. When all is sculpted, set aside to dry. If possible, put on a drying rack and elevate so air can circulate all around the piece. Drying might take a day or more, depending on the climate in your area. When your piece is dry, carefully finish cutting through bottom section – it works best to again use an up and down “sawing” type motion. 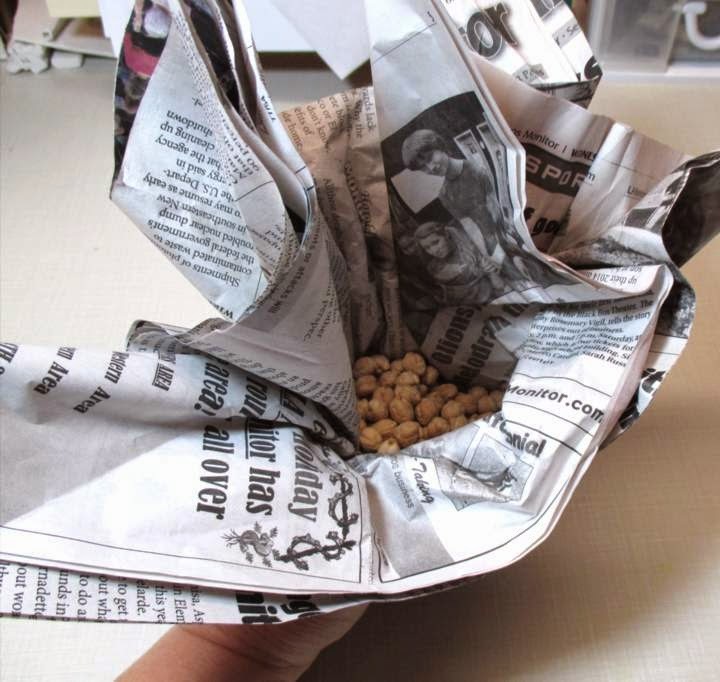 Cut all the way into the newspaper this time, lift up the flap and dump out the beans (bet you don’t see THAT typed very often). 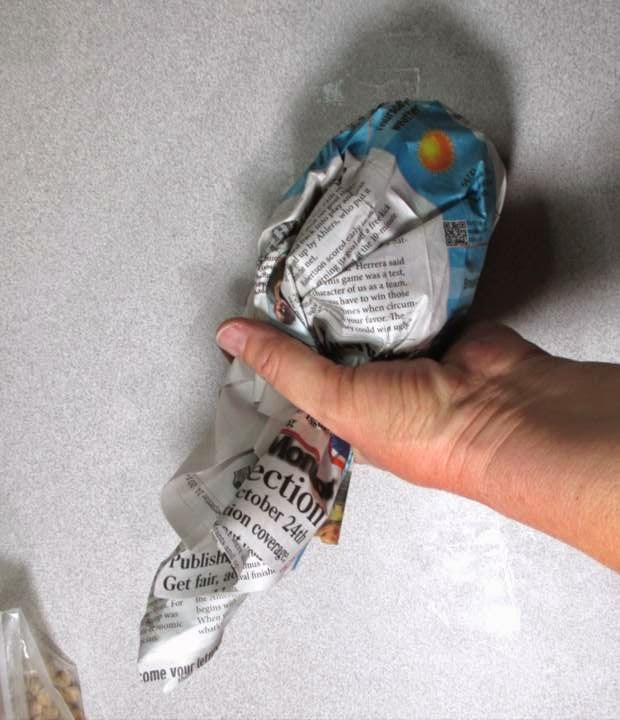 Pull out newspaper/plastic wrap and finish cutting out jack-o-lantern design. 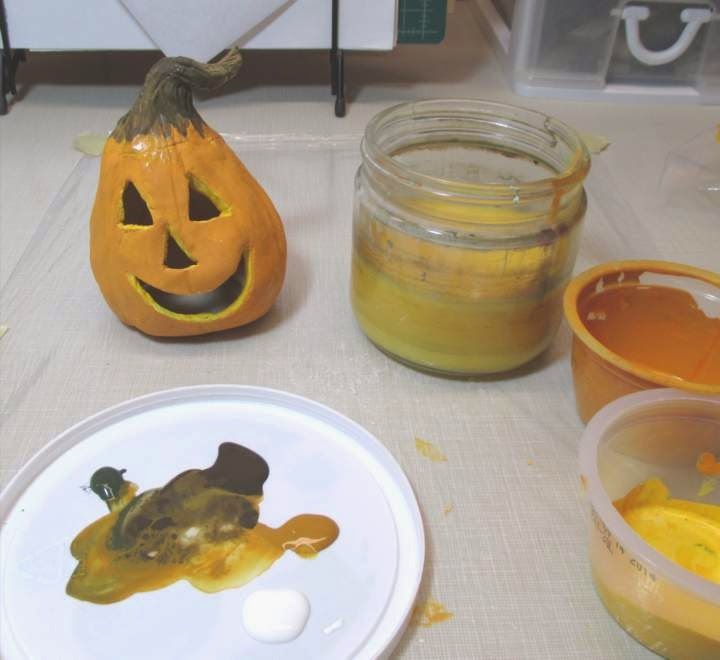 I’ve mixed up a batch of pumpkin color with Pumpkin, Bright Red, Opaque Yellow, Golden Brown, White, and Phthalo Blue, but some of you might find that excessive. 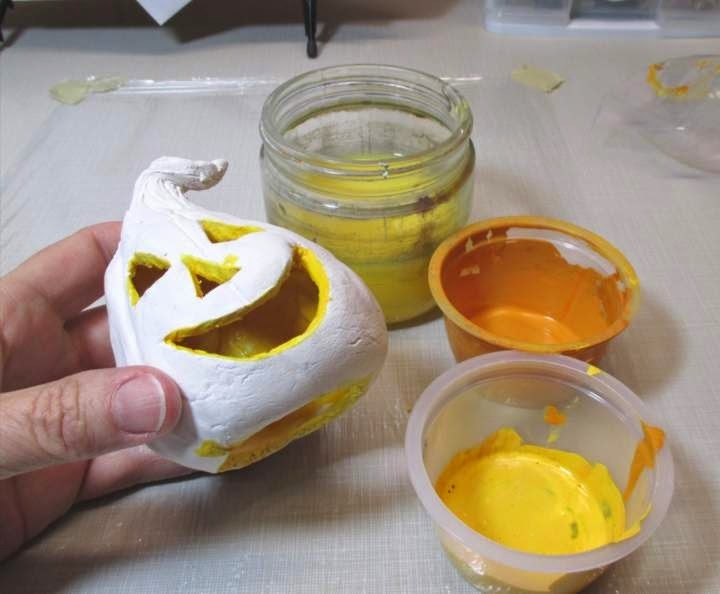 Just pumpkin colored acrylic paint would probably be fine. 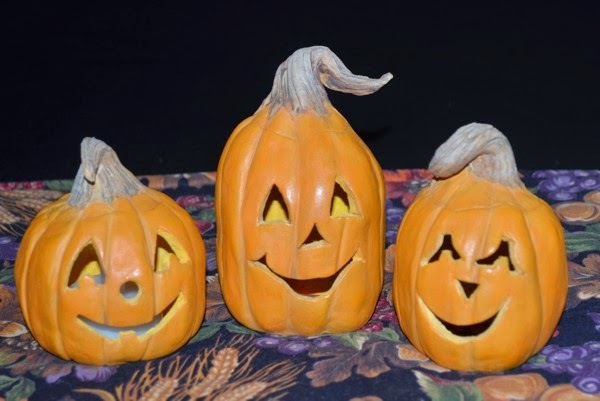 If you’d like a more detailed explanation of my own jack-o-lantern painting techniques please have a look at my directions for miniature jack-o-lanterns on the web site. The pre-mixed pumpkin color in a bottle wasn’t available when I wrote those directions, but I still find the bottled color a bit too “orangey” for my tastes so mixed my own. For the inside of the jack-o-lantern I watered down my paint mixture and let it flow/swirled it around the back portion of the inside of the jack-o-lantern. 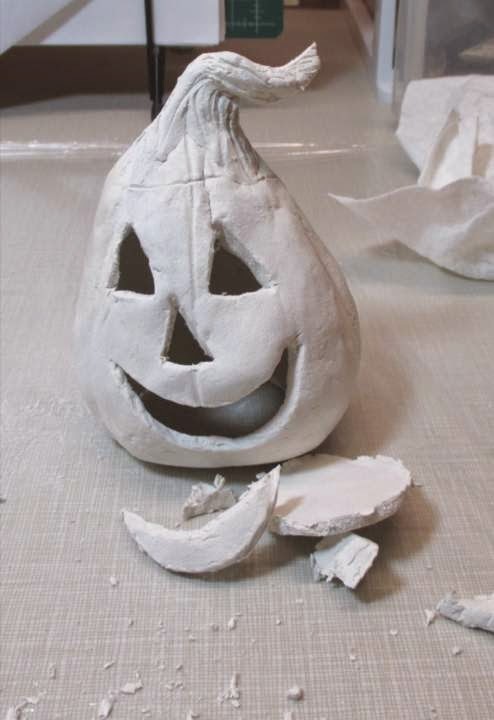 A word of caution: If you reach a point where the jack-o-lantern/paperclay starts getting too wet, you will actually start UNpainting the piece rather than painting it, since the brush will wipe the paint off the clay. If your work starts getting too wet, stop and let it dry out for a bit before continuing. In the photo on the left I’ve got the basics blocked in and am allowing this little guy to dry out a bit. On the right, some of his finished friends have joined him. 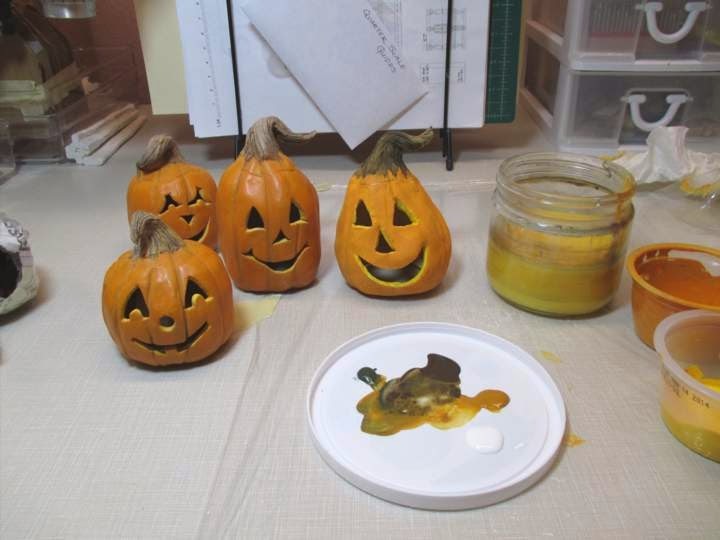 It’s easy to distinguish the difference layering and washes makes in painting the pumpkins. Have fun with your creations! I’d love to hear about how they come out and see photos!